April 3, 2018, — Two senior artists Mr. Junyu Cheng and Ms. Jinyuan Dong recently held a Chinese calligraphy and painting exhibition at Cary Memorial Library in Lexington. A total of $698 in total proceeds from the exhibition was donated to the library. With the 1:1 match by two anonymous donors, each donating $700, a total of $2098 has been raised for the Cary Memorial Library Foundation (CMLF). 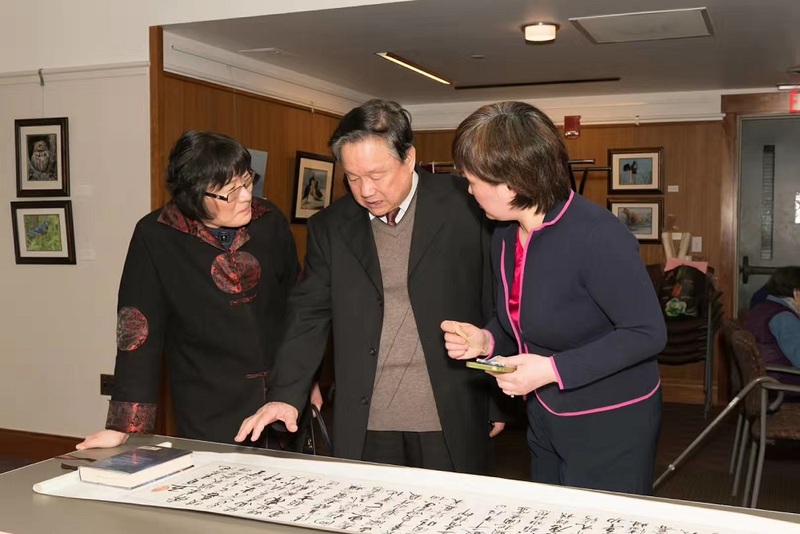 Mr. Junyu Cheng explained his Chinese calligraphy to visitors (photos by Dongxu Shan). During the exhibition, visitors gave rave reviews to the two senior artists masterpieces of their artwork and their spirit of serving the community. 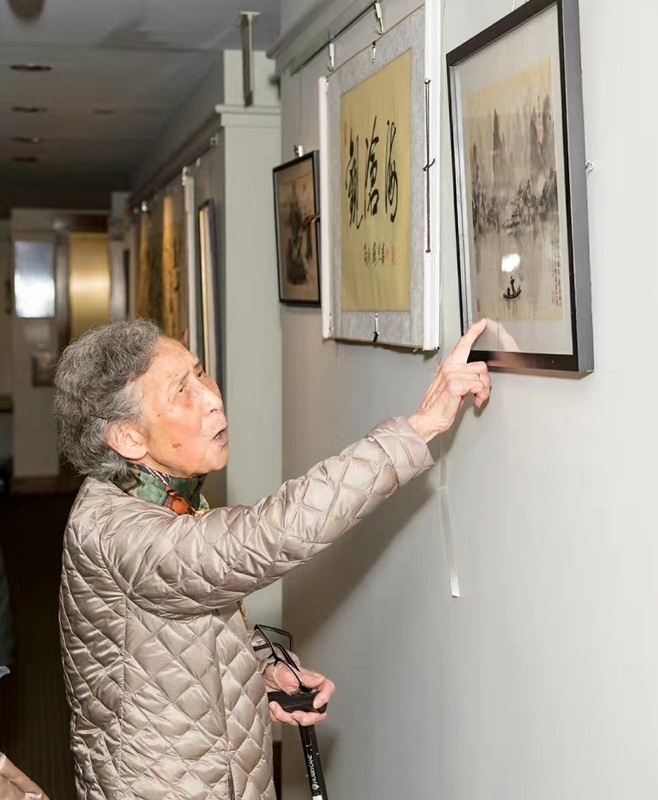 In the opening reception of the exhibition, Ms. Ling Qiu, the deputy director of Cambridge Center for Chinese Cultural (CCCC) Senior Statoin, expressed her warm congratulations to 80-year-old Mr. Junyu Cheng, and 94-year-old Ms. Jinyuan Dong. Mr. Qiu mentored that Cheng was also an active member of the CCCC senior station. Ms. Jinyuan Duan (above) is from Wuhan, China. She began learning Chinese painting at the age of 82. She was in high spirit at the opening reception and happily introduced her paintings to the guests. According to Mr. Hua Wang, who attended the opening reception, the Chinese American Association of Lexington (CAAL) has been committed to participating in various charitable endeavors in Lexington in recent years. CAAL has raised ten of thousands dollars for the Lexington Education Foundation (LEF) and CMLF. Mr. Wang expressed deep gratitude to Mr. Cheng and Ms. Dong, pointing out that they have set a good example for young people.